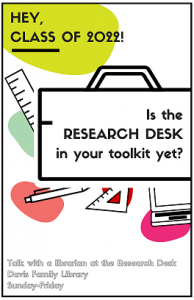 Is the Research Desk in your toolkit yet? Come and talk with a librarian when you start your first assignment. You’ll find that we are always happy to help. You don’t even need a question! Just tell us what you’re working on. Together, we can figure out what you’ll need to do first, next and last. Have a question outside of the Research Desk hours? This entry was posted in LIS Staff Interest and tagged Library Spotlight, LibrarySpotlight, libspotlight on September 5, 2018 by Carrie Macfarlane.